JEWS-HARP, n. An unmusical instrument, played by holding it fast with the teeth and trying to brush it away with the finger. 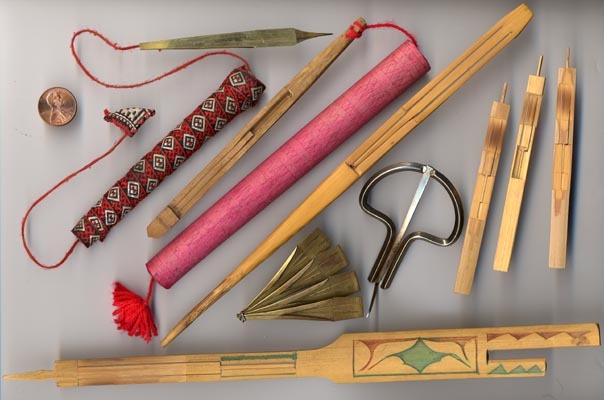 The kubing (also known as kobing, kebing or kumbing) is a fairly typical bamboo guimbarde, with similar instruments (sometimes with palm fronds substituted for bamboo) being found all over Asia, such as the Malaysian bungkao and the Polynesian utete . The instrument is pressed tightly to the lips, rather than being held against the teeth like the more well known heteroglottal types, the pointed tip of the frame being plucked by a finger to set the reed in motion. The player alters the shape of his or her mouth to emphasise different overtones. This dan moi has a reed with a single tip, but reeds with two or three tips are not uncommon. Traditionally, the dan moi is used to communicate coded messages between lovers. Similar brass instruments are found throughout Asia, with iron versions being found in some places.